Tineke and Erk were at our place tonight, and as always they brought along all kind of gifts. 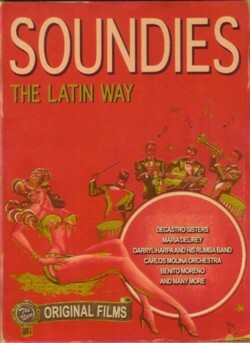 I got a DVD with Soundies, “The Latin way” . 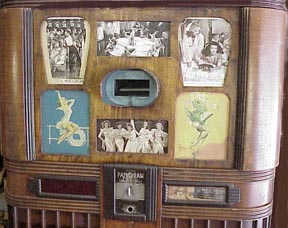 Between 1940 and 1947 there were 1800 movies made as promotion for songs and their artists. These movies, called “Soundies” , could only be watched on special machines, “Panorams”, who worked like jukeboxes. This was before television, so these Soundies are rare glimpses of the pop culture of those days. 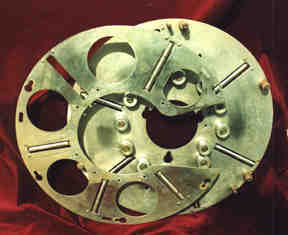 The machine was invented by a man called Mills; the movies were loops, and based on the pictures that i saw of the reels, this was a pretty genius construction. At the height of it’s success there were over 10.000 Panorams in America in use. A Dutch company, the Foreign Media Group, has now released the first three DVD’s with Soundies: one with crooners, one with I can’t-remember-what-Erk-told-me, and the one that I have, with Latin and other exotic tunes. Forty(!) videoclips avant la lettre, 148 minutes of video and music on one DVD, nicely packed in a paper sleeve. I have no idea what such a DVD costs, but it sure is worth some money. This is a labour of love. There will be compilations of rock’n’roll and country and jazz music too, so this seems to be a project that is worth following. To be continued! Here is from the DVD ”Jitterumba“ by Ginger Harmon & Harry Barris. Hello, my father recently passed.Going through his things, we came across original 16mm Soundies~ Broadway Hit Songs, Swing Sister Swing, South American Swing, Rhumba Serenade, Singing Stars, and Thrills from Brazil. I’ve been trying to research these to find out their worth. Is that something you are familiar with? Jennifer, i have no idea of worth, but i guess this is valuable stuff. Try to find a genuine honest collector. If you can’t, i am willing to help you to find one.